These balls are amazing - in fact I was really tempted to call them "amaze-balls" - at the risk of sounding like a teenage girl. But I didn't. 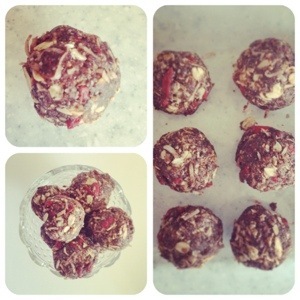 Instead they are super snack balls because they're pretty much made up of SUPERFOODS! They're great for a morning or afternoon snack or a pre- or post-workout bite. They're pretty good crumbled over yoghurt too for a healthy dessert. They work out cheaper than buying a pack of muesli bars and is also much better for you. If you have a look at muesli bars of late you'll notice that almost all of them contain glucose syrup made from wheat - a.k.a. rubbish for your liver. But these little beauties will have you jumping up with energy and your liver giving a you a hug (for once). Mix together well and make into bite-sized balls! Makes ~20 balls at 117 calories per ball.